Instagram is great. I use it and like it very much, for a number of reasons. Even though I have to view it through the lens of “online safety” given my work and professional passion, I still completely support (and am excited about) its widespread and growing adoption by teens (and adults). Similar to other blogs I’ve written, I want to provide some thoughts to those teens who use it, and those who don’t – just a variety of important things to know and consider. Overall, we obviously care greatly that youth embrace technology and have a ton of fun with it, but are also safe and responsible so they can do it for the rest of their lives…without also messing up their lives (or the lives of others) in the process. My favorite aspect of Instagram is that it is minimalistic. Keeping the design, interface, functionality, and interaction options naturally reduces points of vulnerability in social media participation. As compared to Facebook, you can’t see, share, or do much – and I like that. You can take a picture through the app (or just access your Camera Roll to select a picture), add a filter if you want, correct colors and levels, and add a location if you want (which we advise against – if you want someone to know where you are, just text them using your phone – don’t post it in relatively public social media environments!). After you tweak your photo, you then can share it with others through your account (40 million are uploaded every single day!). Also, like in other social media environments, you can add a caption, tag other users in the caption or in comments, and add hashtags in the caption or comments to help others find similarly tagged/categoried photos. For those of you who don’t know, a hashtag is what you’re seeing more often in captions and comments – a word or phrase preceded by a “#”. For example, I could tag a picture of myself at my local beach with hashtags such as #surfsup and #soflo (south florida) and #sunshine and #atlanticocean (or whatever I want). That way, others can select that hashtag (which becomes a hyperlink that you can click through) and see all of the other images that have been similarly tagged or categorized. Instagram’s latest update added the ability to tag others users in your pictures, and I understand why they did this (to facilitate further connections and interactions) but I was like, “nooooooooooo.” I don’t want it to be feature-rich. I want it to be stripped down. I want it to do what it was originally intended to do, and do it well. That said, we are seeing a shift from the way it was originally used as its user base grows. Initially, I would say that it was primarily used as an avenue of artistic expression where unique, creative photos enhanced by fun hipster filters were uploaded – and where others would critique and praise those creations of “instant art.” Now, it’s most-often used by teens and young adults to just take and share pictures of themselves, and themselves with others. In fact, I see a TON of selfies on Instagram, which shows me that it’s just another (currently cool and relevant) way for teens to express themselves to get likes and comments. No big deal. I like selfies. My friends give me crap because I probably post a selfie a week. But it makes me happy to do so, so I am going to keep doing it! And clearly, it provides that same benefit to many others. There are much fewer ways to open yourself up to victimization (or victimize others) on Instagram (than on Facebook or sites which encourage more information sharing). For example, you are not sharing as much of yourself as you typically do on Facebook. You have a nickname, you have a short biographical sketch, you upload photos, and you follow others who do the same. I could say that I don’t want teens to use their first and last name as their nickname, but I don’t think it’s a fatal mistake to do so. I do see some teens post contact information in their Instagram bio sketch (like their Kik nickname, or their Skype nickname, their Facebook username, etc. ), and I would strongly advise against that. If you choose to put other contact information in your Instagram profile, know that you’re opening yourself to being contacted by people you don’t know. And maybe you want that, because you’re bored, or lonely, or just really want to connect with others who are into the same things as you (no problem). Just check yourself to make sure it’s not because you’re desperate for random strangers to notice you, like you, and chat with you. Based on the stories we hear from teens, that sort of thing tends to lead to more problems and drama and headaches than it’s worth. Some of the teens that I know would love for there to be some sort of one-on-one behind-the-scenes messaging functionality within Instagram. I hope that never happens. Instagram is a comparatively safe space for users in large part because you can’t privately message another person. Let’s say you are exploring users, or hashtags, or your friend’s followers – and you see a really good-looking girl, and really want to message her to get to know her better. Unfortunately for you, you can’t. All you can do is post a comment to one of her photos (if her account is not set to private). And she may reply in a comment under your comment – once again, publicly viewable to everyone – but she may not because she might think you are creepy for commenting on a photo of someone you’re not actually following. I love this. I don’t want weird, creepy people with malicious or perverse motives having the ability to message others to try and connect and bond with them just because they liked a photo of theirs. Not that you are like that. But you know what I mean. Please, Instagram, don’t add a messaging functionality. Allow other social media environments to do that. Don’t try to be all things to all people. It will completely ruin what you’ve created. This also brings up another point – teens, please set your Photos to Private, so that people you don’t intentionally accept to be your follower can’t view your photos. Stay in control of your online experience, and what you share (and don’t share) with others. I know you want to gain more and more followers, and perhaps the best way to do this is to let anyone see all of your photos through your own account and by following hashtags to get to your photos. But amassing more and more followers is a never-ending pursuit, and it’s shallow. First, you were so happy when you got a few likes to a picture you uploaded. Then you weren’t happy until you got double-digit likes. Now you want triple-digit likes. And multiple comments. And it kind of bums you out when it doesn’t happen. This is madness, and there is no end to this. It’s never going to be enough, and you are going to waste so much of your life this way. And honestly, you need to remind yourself that people just quickly scroll through hundreds of pictures when they check their phone in moments of boredom (because they are, like you, often following hundreds of people), and just touch each one to like them. Liking a photo on Instagram is a quick, relatively thoughtless piece of interaction that often doesn’t mean much at all. It’s barely a token demonstration of interest. So please do not get caught up in it. It seriously makes me sad when I see so many teens that do. As I’ve mentioned before, your identity cannot be wrapped up in the number of times you are noticed, liked, or validated on Instagram. Oh, and we also see more and more memes being posted and shared on Instagram. We initially saw that occurring most frequently on Tumblr, with memes being blogged and reblogged there. The bottom line is that teens love Instagram and are on it doing things they used to do exclusively on Facebook, Twitter, and Tumblr. While many adults use and love Instagram, I would say that teens have largely taken it over, and repurposed it within their own circles. This isn’t a bad thing; in fact, it shows that the fundamental structure and functionality of the site is simply brilliant. Finally, it should be mentioned that emojis are fun. It’s just really a blast to be able to use them (appropriately)! That said, though, don’t post too many in your captions or comments. It makes you seem like you’re five years old. And it will, in time, open you up to haters. I think one, or a couple, are perfect. In my opinion, they just lose their meaning otherwise! Next time, I’m going to talk in detail about cyberbullying among teens on Instagram – what we are seeing, and how it’s affecting who are targeted. And then we’ll talk about what can be done. I welcome your comments and input! For younger children who are using instagram, I would recommend that their parents check their accounts on a daily basis. If this is occurring then perhaps, parents can help each other prevent cyber bullying on instagram and other inappropriate photos or comments being posted by younger children. Hi Sameer. Love how your article provides a realistic, commonsense approach to Instagram. Great information. 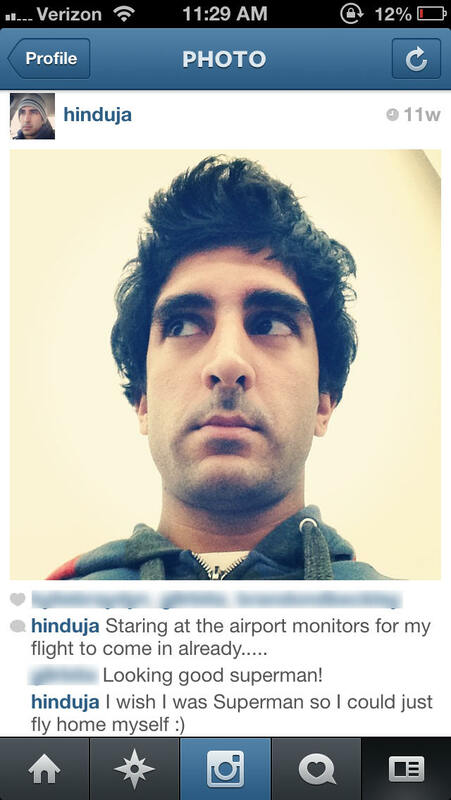 I am also a fan of Instagram because of its simplicity and lack of backchannel potential. I think it’s a good starter app for young teens, because it allows for early teaching and consistent monitoring. I’ve posted a Parents Guide to Instagram on my http://www.GetKidsInternetSafe.com/blog to help parents navigate. Great suggestions for students to keep safe while trying to be part of social networking. It&apos;s rough to be an adolescent. So many pressures, and so many insecurities. We just have to keep coming alongside our youth and planting the seeds of wisdom and discretion. Thanks, JP! I hope many parents and teens read your article on staying safe on Instagram. I am not on Instagram so this helped give me a glimpse into it. I think it is definitely a smart choice to keep things as private as possible and to stick with the people that you know. Thanks, AK. It&apos;s worth checking out if you have a few minutes to download Instagram and play with it. It might help you to be more familiar, so that you can better advise the youth you serve and care for. I agree! I think in order to fully understand what our children are using, we need to be familiar with it ourselves. Do we need to make a full profile and use it to understand? No! But we should definitely make sure we know how to navigate and what our children would potentially do on each social media site. Agreed, Laura. And it doesn&apos;t hurt to sit down with them with your favorite dessert and have them show you how to use the app, and how it makes their life better, and what they love about it. A little familiarity goes a long way, like you said. Thanks for commenting! I know very little about Instagram so reading this article gave me a better idea as to what it is and does. I think that it is very important to stay safe and watch what things you are posting. I wish that students, parents and even co-workers would do the same. I do hear of students using Instagram to bully. Of course it never ends well. I think you&apos;re giving teens great advice when it comes to instagram. Many teens try to get as many followers as they can, which means they have absolutely no idea who is actually following them. These people aren&apos;t friends or acquaintances which is quite scary, especially if teens are posting pictures that reveal information about where they live, or what places they frequent. Granted, you can&apos;t provide as much information as you can with Facebook, but it can be just as dangerous if teens don&apos;t know proper social media etiquette. Thank you, KB. I completely agree. Honestly, I want more followers, but the reality is that there is no end to that desire, I won&apos;t ever be satisfied. Plus, it doesn&apos;t mean much in the grand scheme of things. We just have to try to not get caught up in things! As someone who has never used Instagram, I found this to be a very thorough summary of how the app works. Thank you for pointing out the advantages and disadvantages of it. As a middle school teacher, I see all too often how getting "likes" or not on Instagram can define their identities and impact their moods and their self image. I hope, as you do, that the messaging feature does not become enabled; this would open the door to ease of contact with strangers who may not have the best intentions. Thanks for sharing! You&apos;re welcome, Nicole! Your words are on point. We just have to keep sharing these messages, but in a tone supportive of technology and social media so our kids don&apos;t outright tune us out. This couldn&apos;t be truer! Even though I am not a frequent Instagram user I have dabbled with it on several occasions, but I am still clueless with this whole hashtag thing. (#Confused) I frequently hear from my middle school students that Facebook is for old people and EVERYONE else is using Instagram. I guess I should make another effort to jump on the bandwagon, but fear of being sucked into another social media site that consumes more of the time I don’t have. You provided great advice regarding how “your identify cannot be wrapped up in the number of times you are noticed, liked, or validated on Instagram,” but sadly so much of our youth is using this criteria to judge their self-worth. Thank you for sharing your knowledge of Instagram and the safety benefits it has compared to other social media sites. Thank you JS! It&apos;s hard and all of us get caught up in the desperate need for validation from others. We have to derive our identity and self-worth out of something that doesn&apos;t change…something solid. I know you agree. It&apos;s hard to be a teen these days. As youth-serving adults, we just have to keep investing in them and loving on them. Thank you for posting about Instagram and teen use. I agree that the app was once and is still used "as an avenue of artistic expression where unique, creative photos enhanced by fun hipster filters were uploaded – and where others would critique and praise those creations of “instant art.” " In a world where teens are seeing less and less art classes in their schedules due to budget cuts, etc. , apps like Instagram offer them that platform to be innovative. On the other side of the coin, as a school counselor, I have heard firsthand about the fake accounts that were created purely to humiliate a classmate, cruel hashtags, and harsh comments. You offer a lot of great strategies for teens who enjoy using this app like turning off their location services, utilizing un-identifying nicknames as usernames, and most important, making sure that their account is private. These are all tips that educators and parents should be sharing with our youth! Thank you! Thanks, Sabrina! Like anything, an ounce of prevention is worth a pound of cure. I can&apos;t believe I just typed that out, my mom would be proud I remember what she&apos;s taught me. Anyway, please feel free to share the post with educators and parents who can continue to get the message out! Again, thank you! Hey there! Your article was very informative and reader friendly for us amateur app users. I myself prefer to use Instagram, because it is very private. As someone who works in an educational setting, I would love to refer students and their parents to your article. You help to promote and reinforce the importance of privacy and saftey for Instagram users. Teenagers need to be awareof the danagers of social media; and the potential for cyberbullying. More importantly, parents need to understand how social media apps work and how their children should be using them. The more parents and teenagers can talk about internet safety, the better off teenagers will be socially and emotionally. Thank you again for your advice and tips on using Instagram; as well as the safety benefits of this social media platform! I myself don&apos;t use Instagram, but I do have three daughters and I know they use it all the time. As long as it is used responsibly, without harming anybody, it is a great tool to share pictures between friends. However, many kids do accept requests from people they don&apos;t really know, and that could pose a big problem. Not everybody are who they say they are and a cute picture of a teenage boy, may mean something totally different. Great advice on using Instagram! There are too many kids being cyberbullying these days and it&apos;s scary of how this affects their lives in the long run!! I&apos;m glad you are approaching things with a level head. It&apos;s easy to get freaked out about an app you haven&apos;t tried. As long as we are raising decent, empathetic human beings, hopefully what we&apos;ve taught them will apply offline and online regardless of what they do. Thanks, Maggie! As a middle school teacher an a parent of a middle school child, there was a huge debate about allowing teens to join instagram or not. The fear in many parents was overuse and feelings getting hurt when a child is left out of an event. I think with responsibility and monitoring, Instagram is fine! Your blog said it the best "As I’ve mentioned before, your identity cannot be wrapped up in the number of times you are noticed, liked, or validated on Instagram." My advice to parents and teens is to monitor and limit use.These apps can NOT be your life! Dee, you&apos;re awesome. I completely agree and while it&apos;s perhaps easy for us as adults to see the ways in which social media falls short in meeting our kids&apos; need for true identity and self-worth through superficial approval and validation, it&apos;s easy to get caught up in it. I appreciate your thoughts! I appreciated your insightful comments about Instagram. I agree that Instagram can be a great platform for kids to share their photos and creatively adjust filters to enhance their images and add artistic expression. However, while I think that it can be fun for kids to share pictures of the places that they traveled to, images of the interesting foods that they ate, or cute pictures of their cats, I also think that Instagram can be potentially dangerous because kids can create fake accounts and upload pictures of others without their consent. I totally agree with you that adding a messenger feature to Instagram would be problematic, as this opens up the gateway for teens to privately harass one another, or for strangers to inappropriately seek out under-age children. You gave some excellent tips for young adults to stay safe on this social media site, such as adding privacy features and limiting the personal information that they share. Unfortunately, though I share similar advice with my students all of the time (as does the administration in the school where I teach), younger adults still sometimes share too much information on Instagram, or they use it as a platform for cyberbullying. I think that the issue is that younger adults tend to be more impulsive and do not always realize the consequences of their actions. However, I believe that sharing your tips and continuously reminding my students that Instagram should be a tool for expression, not for hurting or embarrassing others, is still somewhat effective. Thanks for the information. Thanks for your thoughtful reply! You know what, IG did add a messaging feature since I wrote this blog. I have used it to quickly message a friend. We just have to hope that youth are not unncessarily engaging in protracted communications with strangers without making sure they are legit and honorable people. Your points are well-taken. We just have to keep talking these potentialities out with the kids we care for. Great article that gives insight into Instagram and the potential hazards that our teens face. I particularly like the advice given to teens about keeping their accounts private. I also agree that kids get caught up in the "insta" world and need instant gratification! Working in a middle school, I have unfortunately seen an increase in instagram being used with cyberbullying. I wish that parents and students would be better educated on the need for safety, privacy settings and appropriate social media use. Your comment about not having your identity wrapped up in the number of likes is so true, however middle school students are often not only wrapped up in the number of likes but also how their number relates to those of their friends. Although unrealistic, I would love for middle school students to be required to take a course on social media prior to them being allowed to access them. All I know about instagram is from the information my students give me. I had a basic understanding of the site and how it is used, but I have yet to actually ever sign up for my own account. After reading your article I have a much clearer understanding about instagram and the challenges it brings to the already growing problem of cyber bullying. I think all educators and parents need to be aware of how young people are using this site at all times. We should not allow complete freedom to say or do whatever they want without feeling like they have someone holding them accountable each time they post something. I appreciate that you said we need youth to embrace technology and your support for apps like Instagram. It is important that we acknowledge that we can not pretend social media apps don&apos;t exist when our children are using them daily. I think it&apos;s great when teens use the app to express themselves. I also agree that there is a lot less sharing information on instagram when compared to facebook. However, teens can add links to their bio and share more information than was originally intended. Thank you for sharing advice on the location settings. I try to explain to my students how unsafe sharing your location is. This article has some great advice for teens that I think can apply to more than just teens. I was wondering if you might have any additional advice since Instagram has changed since this article was published and now does allow videos, messaging, etc. I also agree with a previous poster, that middle school students should be required to take a course in appropriate social media use. The technology is so rapidly changing that it can be hard to keep up but teaching basic safety information and the importance of kindness on these platforms would be very beneficial. Hey Jill! I hear you and totally agree. You know what, more and more schools are implementing curriculum to help. Please check out our book for middle and high schoolers – https://cyberbullying.org/words-wound-delete-cyberbullying-make-kindness-go-viral – which also comes with a free Leader&apos;s guide – https://cyberbullying.org/leaders-guide-words-wound – which you can use immediately! Let us know if you do and we can help with advising how you put the program to work. I will work to update this blog as soon as I can, given the recent updates to Instagram. Drop us an email if you need anything else!